Last weekend we headed to the land of Ikea. We really try to avoid that place on the weekends, but we needed just a few storage items to finish our kitchen project. It was full of people that walk way too slow and are always in my way, hee. I kid. It was fine. Anyway, I’ve been searching for the perfect retro kitchen clock for quite a few months and haven’t found anything that I really love (and fits in my budget). I wandered into the clock section and discovered the PUGG clock for $11. Yes. That’s definitely in my budget. The only thing is I was hoping to find a colorful clock. This PUGG clock is silver, so I decided to paint the thing. With the color update, my painted ikea clock fits perfectly in my kitchen! Want to make one for your home? I shared a quick how-to paint below. It’s so simple. 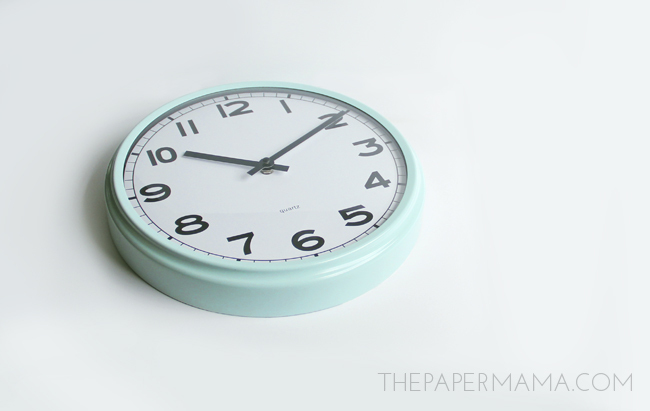 – The PUGG clock really is perfect for this project. 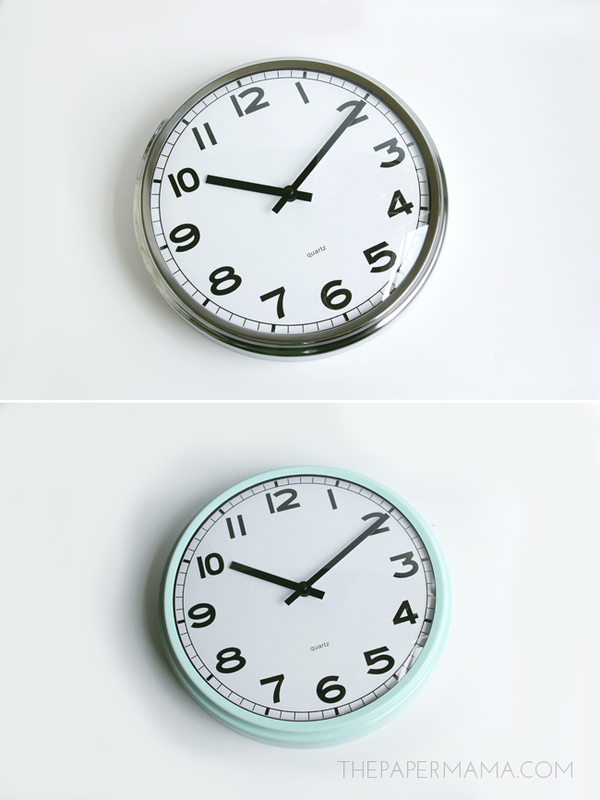 The glass and clock parts are easy to remove. Flip the clock over and remove the 4 metal v’s (these are what hold the clock parts in). You can easily take these out by pushing the two “v” points down and out of the clocks metal edge. Set the glass and clock parts in a safe place. – Painting metal can be tricky. I suggest reading and following the directions on the back of your spray cans. Going too fast can cause bubbles and dripping, waiting too long between coats could cause paint to crack and bubble (all learned from experience). Here’s how I paint metal: In a well ventilated space (wearing protective eyewear and a mask) start with a couple coats of primer (allowing 5 minutes between each coat). Let the primer dry for about 30 minutes before you use your colorful spray paint. Spray the first coat of colorful paint on the clock frame. Apply about 3 – 4 coats of the color paint (allowing 5 minutes dry time between each coat). 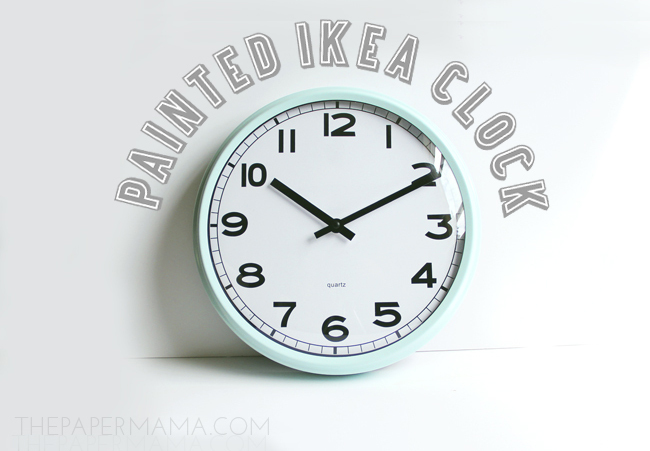 Optional: The colorful spray paint I used was matte and I wanted my clock to be shiny. I let the color spray paint dry for 30 minutes then applied two coats. Let the paint dry for 24 hours before handling. – You’re done! Hang in the kitchen and enjoy. I love this! I have this clock in my room. I def want to try this DIY. Thanks for sharing! STOP IT I WAS JUST LOOKING AT THIS CLOCK LAST NIGHT. And girl, that is MY color!!! LOVE THIS!! Pinning now. This is such a nice idea! Love the colour you chose! !